On-site nitrogen gas generation technology for manufacturing and processing industries is increasingly recognized as a cost effective alternative of supplying nitrogen gas to industrial applications & processes. 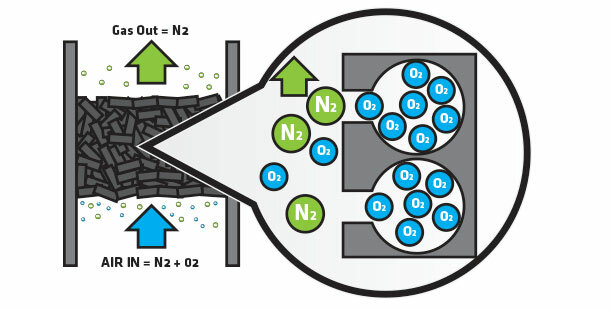 Today, the technology used for on-site nitrogen gas separation consists primarily of two key techniques: Hollow-Fiber Membrane and Pressure Swing Adsorption. Hollow-fiber membrane is a relatively efficient method of separating nitrogen gas from other atmospheric gases, however, it has limitations in terms of longevity and the purity of nitrogen it is capable of delivering to downstream applications. On the other hand, Pressure Swing Adsorption (PSA) is a highly effective and robust technology that can be scaled to meet the majority of flow rate requirements. Overall PSA is considered to be a better system of gas generation as it produces cleaner, dryer, better quality gas from a compressed air supply, with a lower dew point and at high purities. What is nitrogen PSA & how does it work? PSA is a technique that allows the separation of a gas mixture into its individual components by utilizing a solid molecular sieve as an adsorbent. In the case of nitrogen, the adsorbent used is carbon, to which certain molecules, preferentially adsorb under pressure. A Carbon Molecular Sieve (CMS) is essentially a bed of small carbon beads or pellets. When a nitrogen purification column, packed with CMS, is pressurized with compressed atmospheric air (mainly consisting of nitrogen, oxygen, carbon dioxide and argon), oxygen, carbon dioxide and moisture are adsorbed by the carbon beads, whereas nitrogen does not. This occurs primarily due to the angstrom size of nitrogen and oxygen based molecules – the CMS pores are exactly the right size to adsorb oxygen and its molecular compounds (such as CO2 & H2O), whereas the nitrogen molecules are too large. Compressed, wet air is fed into the nitrogen purification column under pressure. Oxygen, H2O and CO2 molecules are adsorbed into the porous structure of the CMS whilst nitrogen molecules pass through the column and are collected downstream, in a storage vessel, where it can be fed to applications on demand. When saturated, the nitrogen purification column undergoes a cycle of decompression, where the pressure is rapidly dissipated by venting adsorbed oxygen, CO2 and H2O molecules to atmosphere, eventually normalizing in preparation for the cycle to repeat. This whole process also requires a constant temperature, which should ideally be as close to ambient conditions as possible (20-25 degrees Celsius). Why choose a Peak Gas Generation i-Flow PSA nitrogen gas generator? Utilizing the latest gas generation technologies, i-Flow is the best in its class of pressure swing adsorption based nitrogen gas generators. It is a highly cost effective, efficient & reliable solution for supplying nitrogen gas to a broad range of manufacturing and processing applications, such as blanketing, drying, fire prevention, gas flushing, packaging, process inerting, sparging and many more. A single i-Flow generator can produce over 4000 litres per minute (or 240+ Nm3/hr) of very clean, very dry nitrogen gas, at purities ranging from 5% to 99.9995% (ultra-high purity N2). It is a modular and scalable solution that can be expanded retrospectively to grow in line with your facility needs. i-Flow is not only capable of meeting broad and varying customer supply requirements, it can also help companies improve manufacturing efficiencies, reduce costs and meet sustainability targets. Want to find out more about how Peak Gas Generation's nitrogen gas generation solutions can help maximize your productivity? CONTACT US TODAY.